Photo courtesy of Wright State University In addition to teaching a course on conflict and peace in literature, associate English professor Andrew Strombeck is organizing a photography exhibition and a literary conference on the Dayton Literary Peace Prize next fall. Accords will feature a photography exhibition and a conference, with a number of speakers, panel discussions, and artistic performances by Wright State students. FAIRBORN – A Wright State English course examines how literature addresses conflict and promotes peace by reading works from some of the winners of the Dayton Literary Peace Prize. In The Literature of Conflict course, students learn about the historical events covered by the books, such as slave revolts in Jamaica, and discuss how the literary work intervenes into that history. “It’s about how literary forms like the novel and the short story address violence and conflict, and what that suggests about what literature might do to promote peace,” said Andrew Strombeck, Ph.D., associate professor in the Department of English Language and Literatures who is teaching the course. The course is connected with Accords: Peace, War and the Arts, a special project Strombeck is organizing to commemorate the 10th anniversary of the Dayton Literary Peace Prize this fall. 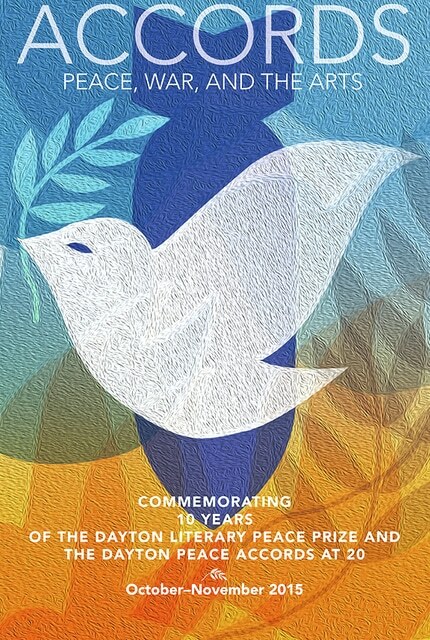 Founded in 2005 in commemoration of the 1995 Dayton Peace Accords, the Dayton Literary Peace Prize annually recognizes the best fiction and nonfiction literature that promotes the cause of peace. “Not only is the prize a crucial part of Dayton’s literary cultures, it also poses important questions about what work literature might actually do to promote peace,” Strombeck said. Accords: Peace, War and the Arts will be held in October and November and will include a photography exhibition and a literary conference at Wright State. “Visions of Conflict” will feature national and international photographers and lectures in the Robert and Elaine Stein Galleries. Ten Years of the Dayton Literary Peace Prize: A Literary Conference will celebrate the legacy of the Dayton Literary Peace Prize by examining how literature engages war, promotes peace and encourages conflict resolution. The conference will feature theatrical and musical performances from Wright State students, a variety of speakers, including some Peace Prize winners, and panel discussions. Students in Strombeck’s class produced materials for the conference, including research posters, readers’ guides for local libraries and secondary educators, and research papers that some will present. “I see this conference as a great opportunity for students to present their work to a wider public than their professors and peers,” Strombeck said. Strombeck is organizing the conference during a fellowship with Wright State’s Ohio Center of Excellence in Collaborative Education, Leadership and Innovation in the Arts (CELIA). He said he wanted his fellowship to focus on the literary peace prize because it supports and strengthens Dayton’s literary cultures and responds to a bright moment in international affairs, which is also important to Dayton’s history. Along with the Dayton rock band Guided By Voices, the Dayton Peace Accords were one of the two things Strombeck knew about Dayton before he moved here. “The idea that people who wished death on each other could be brought together to work things out seemed so powerful to me as a young person in the 1990s,” he said. In the literature course, students read “Peace” by Richard Bausch, “The Surrendered” by Chang Rae Lee, “That Thing Around Your Neck” by Chimamanda Adichie, “The Book of Night Women” by Marlon James, “The Brief Wondrous Life of Oscar Wao” by Junot Diaz and “Billy Lynn’s Long Halftime Walk” by Ben Fountain. Literature is one avenue through which students are exposed to historical conflicts, Strombeck said. Excluding student veterans who serve in conflicts, many American students are largely insulated from wrenching histories of places that have experienced conflict, like Nigeria, Korea and Ethiopia, he said.